Kaos GL was inaccessible for hours on 28 June due to a DDoS attack while police assaults continued on Istiklal Street. Yesterday, our Kaos GL website was targeted at the very moment police assaults began against the Pride Parade. The attack continued for a long time, preventing access to the website. At first we thought this to be a technical problem but out communications uncovered this to be an attack. That the cyber attack was deployed simultaneously with the [police] intervention to the Pride is of great significance. That a cyber attack is deployed while LGBTIs who exclaimed ‘homosexuals will not remain silent’ on the streets were assaulted with tear gas means that there is a [coordinated] effort to silence LGBTIs. Our website was unable to recover until late last night. This prevented us from communicating rights violations. We experienced violence on the streets as well as intervention with our right to speech. We do not know who the assailants were, but we witnessed tweets pointing Kaos GL as a target and claiming ‘this is how we silence you’ Naturally, we have documented each of these instances. We believe that this was a concerted attack. They tried to silence us and failed. Just as the rainbow flag was flying over everywhere yesterday, Kaos GL too continues its broadcast. DDoS (Distributed Denial-of-Service) is an attack where a server receives considerable amounts of requests by many computers simultaneously to the point of inoperability. It does not [necessarily] mean that the server in question was breached. 7 trans women were assaulted in Istanbul in the last month [May 2015]. Some assaults occurred out of nowhere while women were walking on the street, some occurred in women’s homes. Other trans women who heard that trans women have been assaulted rushed to the hospitals and waited outside the ER in solidarity, even when they did not know the victim. Yet, the attacks continue and very few of the women apply to rights organizations regarding what they experienced and initiate legal procedures. Istanbul LGBTI [sic- correct name Istanbul LGBTT], one of the organizations working for trans rights, reported that only three trans women applied [for support] following the attacks. Two of them did not continue the necessary legal procedures afterwards; one is waiting for her recovery. Despite the raids and evacuations of trans homes in Cihangir and torture in police custody, the LGBTI in Turkey became organized during the 1990s. Lambdaistanbul and Kaos GL associations were founded after the police dispersed the 1993 Pride Parade and the first LGBTI publications appeared. The 1990s were the years when the LGBTI movement started to organize as a social movement against police violence. Despite the raids on homes and nightclubs and the days-long torture in police custody, these years witnessed the foundation of the Lambdaistanbul and Kaos GL associations, the LGBTI organizations in universities, and the first LGBTI publications. The first Pride Parade named “Sexual Freedom Events” in 1993 in Beyoğlu was blocked by the police based on the governor’s ban. Activists’ houses were raided and they were taken into custody. Participants from abroad were deported. The first pride parade was held ten years later in 2003 and was attended by 40 people. In the last pride parade, 2014, tens of thousands marched. Sevda Yılmaz, who wrote under the pen-name of Ali Kemal Yılmaz, tells the story of a hunger strike that began on 29 April 1987 to protest the systemic violence and oppression of gay and trans individuals at the hands of the Beyoğlu Police Department. The Radical Democrat Green Party Initiative supported the strike. The strike which began in a house in Taksim moved to the stairs of Gezi Park on 30 April and was dispersed by the police. The strike continued in different houses for a couple of weeks. 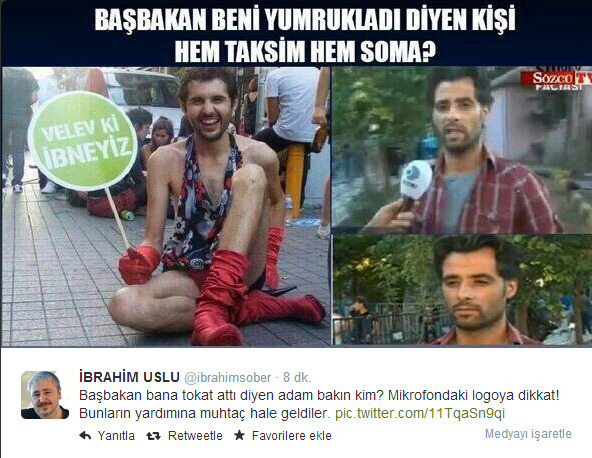 Yılmaz was the spokesperson for the strike, which found coverage in international press and drew the support of important artists such as Türkan Şoray, Rıfat Ilgaz and Barış Pirhasan. This hunger strike is remembered as the first large-scale LGBTI protest before the 1990s. The guide answers the question of what reporters need to pay attention to when covering issues related to sexual orientation and gender identity. Kaos GL and Pink Life, Turkish LGBTI organizations, have compiled a practical media reference guide for journalists reporting on LGBTI issues. The guide provides a framework for keeping in regard certain points when reporting on LGBTI related policies in Turkey. The guide offers rights based suggestions on topics regarding use of language and terminology in reporting news related to gender, violence and suicide, news sources, off the record statements, use of photography, and respecting privacy. What should a reporter pay attention to? The guide includes excerpts from news reports that include hate speech against the LGBTI community and explains the approach to reporting taken by the news portal of KaosGL.org and Kaos GL magazine. We defend the freedom of news, commentary and critique. However, we distinguish between the news, commentary and opinion regarding current events. An author can express their personal opinion on the reported issues only by signing their name under the article. The journalist reports news and refrains from commentary. We do not state agreement with anyone. We do not draw conclusions from any information. We do not homogenize people and events. We do not exclude anyone. The guide underlines the important role media workers play in spreading awareness of forms of discrimination related to gender, sexual orientation and gender identity across a wider base in society. Gay man, lesbian woman vs. heterosexual man/woman? References in news reports to individuals’ gender, sexual orientation and gender identity in contexts where these are irrelevant to the content of the news constitute discrimination. Just as we do not mark heterosexual and male individuals as heterosexual male; we should not be marking women, gays, bisexuals and trans individuals when such characterizations have no direct relevance to the news content. “The transvestite whose real name is…”! News reports use trans individuals’ names as they appear in their identity cards without their permission. Reporters must use the person’s chosen name and surname. Instead of gender change/correction surgery, use “gender transition surgery” or “gender reconstruction surgery.” Phrases like ‘change’ presume the assigned gender as their basis and contribute to the perception that trans individuals are less “woman” or “man” than how they feel and express. This aggravates the othering process. It is inaccurate to use the term “sexual preference” to describe homosexuality, bisexuality and transsexuality. Like heterosexuality, homosexuality and bisexuality are sexual orientations; transsexuality is about gender identity. The terms “sexual orientation” or “gender identity” must be used instead of “sexual preference“ in accordance with these definitions. In reports relating to LGBTI people, there should be no references to derogatory slang in headlines or no reporting using such slang. It is important to avoid unnecessary references and innuendos such as “The ball is in the court for the LGBTI association court case” in order not to reproduce discrimination. The ninth Anti-homophobia Meeting organized by Kaos GL concluded with a march against homophobia, transphobia, hate and workplace murders. 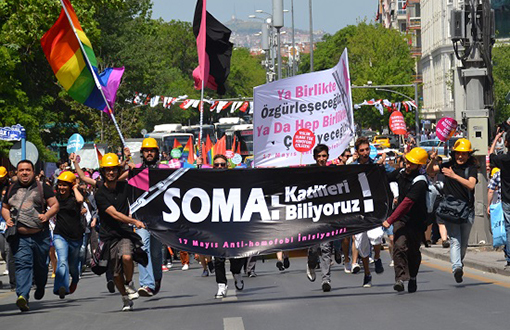 * Thousands joined the march dedicated to the hundreds of workers who were killed in the Soma Mine. Signs such as “Soma: We know the Murderers” and “Either we will be emancipated together; or we will rot together” were carried at the protest that began at the Ankara University’s Cebeci campus. Those who joined the protest included representatives of LGBTI organizations from Ankara, Istanbul, Mersin, Adana, Diyarbakır, Kars, Dersim, Malatya, Antalya, İzmir, Eskişehir and Antep as well as representatives from HDK (the Democratic People’s Congress), ESP (The Socialist Party of the Oppressed), SYKP (the Socialist Reconstitution Party), SDP (the Socialist Democracy Party), SGD (Socialist Youth Associations) and ÖGK (Free Young Woman). LÖB (High School Students Union) and IHD (Human Rights Association) were present with their uniforms. And the red flag finally reached out for the rainbow.